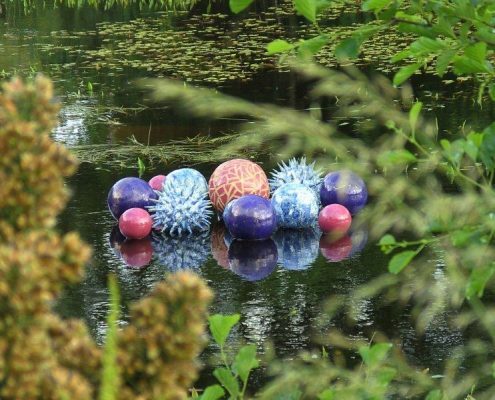 Award winning ceramic outdoor water sculpture, Pollen Hotspot was hand-built and sculpted in a cranked paper clay body and high fired in an electric kiln. 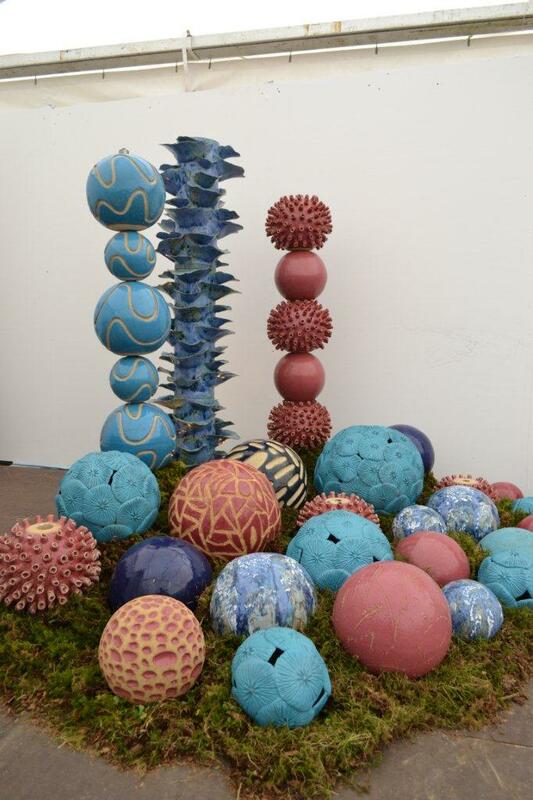 It is inspired by micoscopic pollen grains and has appeared at numerous of exhibitions throughout Ireland. 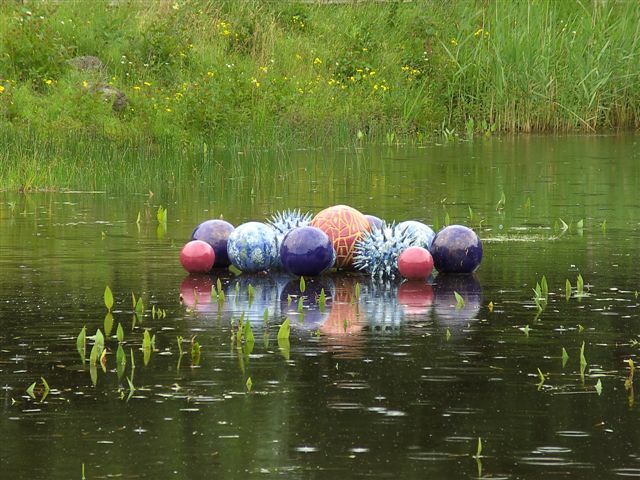 Nexus (2010) at The Bluewall Gallery, Cavan. National Craft Gallery Garden at Bloom 2009 at the Phoenix Park, Dublin and Castle Yard, Kilkenny. Claremorris Open 2008, Pollen Hotspot, Claremorris, Co. Mayo. 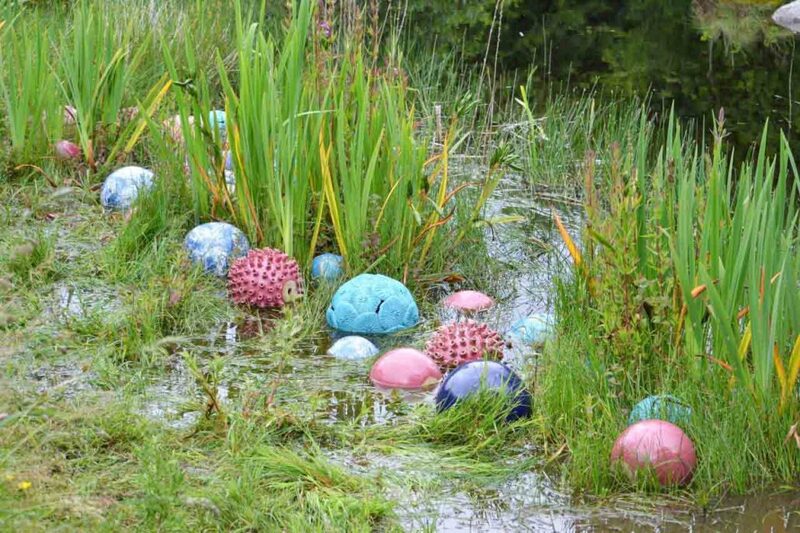 Outside: Insight, Sculpture in the Gardens 2008, at Brigit’s Garden, Roscahill, Co. Galway (Public Award). Sculpture in Context 2006 at The National Botanic Garden, Dublin. Dimensions: original 17 piece sculpture 1.5m x 1.5m. 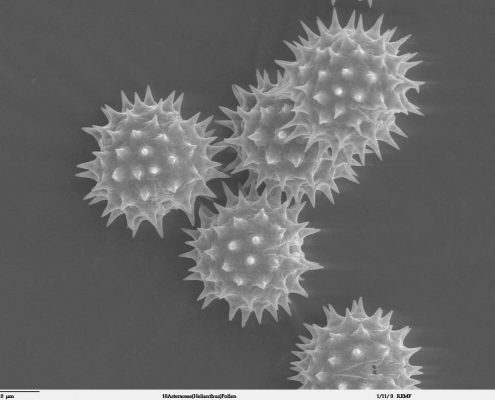 Individual pollen spheres available in various diameters from 15-35cm. 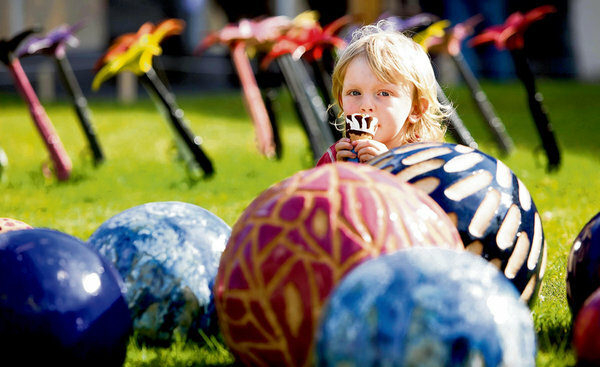 Price: original 17 piece sculpture €4,500. 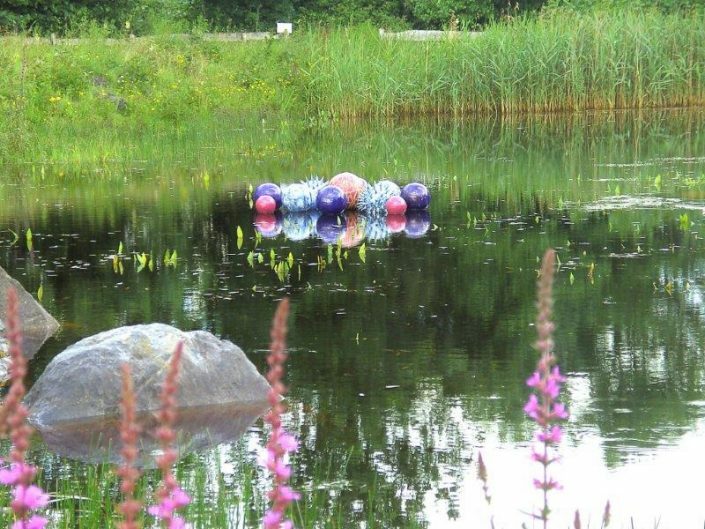 Individual pollen spheres available – €150-€695 depending on size. Limited number of pieces available for sale. It is a secret world visible only under a microscope. To imagine their size or quantity is unfathomable. They range in size from 20 to 250 nanometers – and a nanometer is a millionth of a millimetre! They are produced in such quantities that it defies imagination. A single birch tree might produce as much as 5 billion pollen grains in just one season. In addition, pollens are composed of such an incredibly resilient substance that they are resistant to rotting and can survive tens of thousands of years. 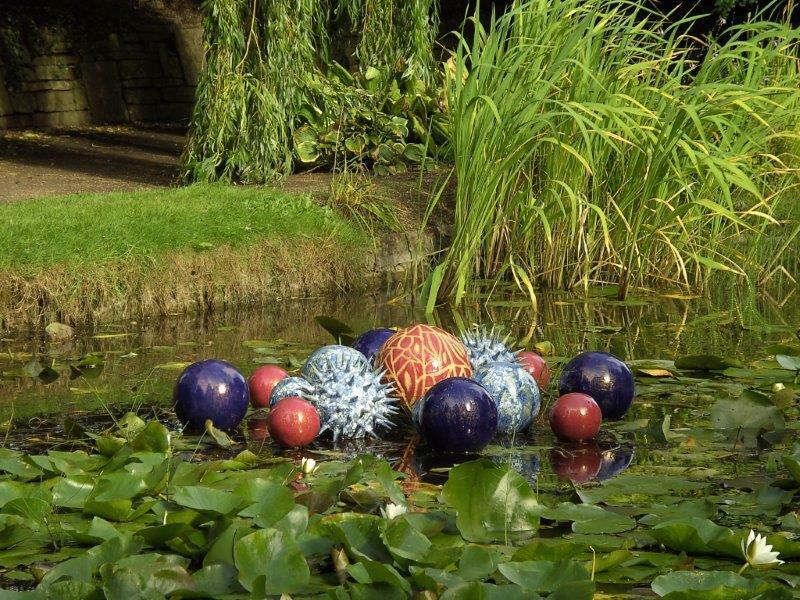 In appearance they might easily be mistaken for something from another planet. 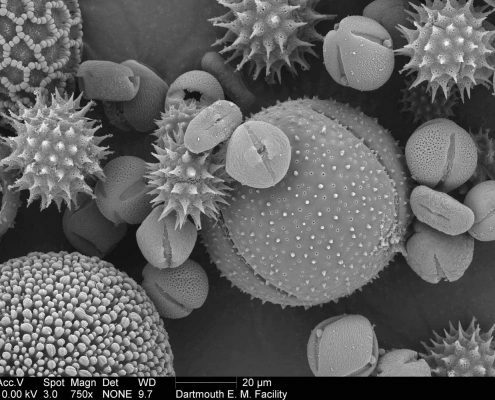 Indeed pollen grains, which are usually spherical in form, have surfaces that often consist of very elaborate, three-dimensional patterns. 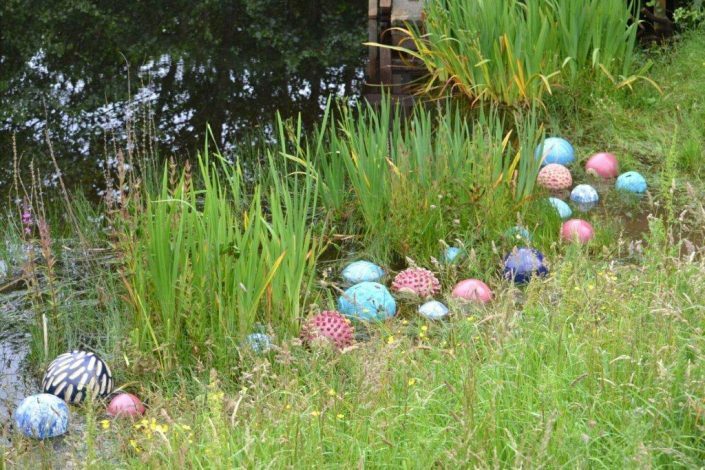 It is hard to imagine that all around us these tiny little sculptures exist in vast numbers, simply waiting to be carried by the wind or an insect to their final destination. Of course the majority of pollen grains produced by a plant will never reach that destination. In this piece I hope to give the viewer a glimpse into an aspect of the natural world not normally seen by the naked eye. 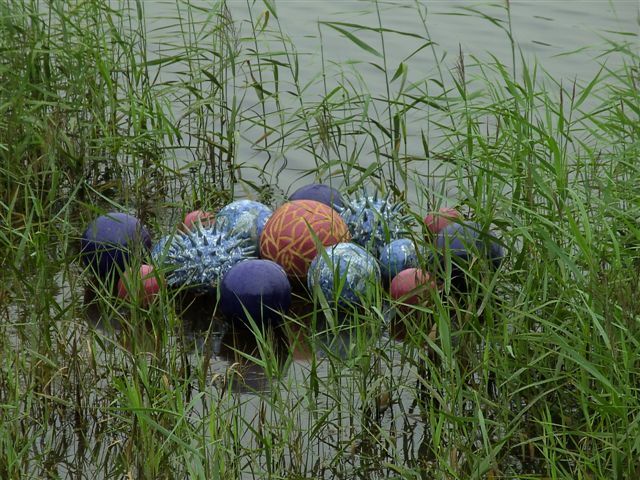 Pollen Hotspot is a hand-built and modelled ceramic water sculpture. The individual spheres were hand built in my Dublin studio. 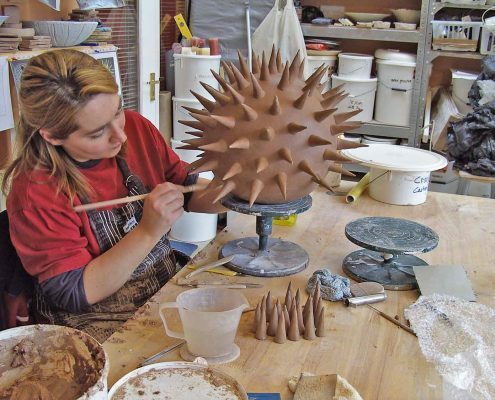 For the spikey pollen each separate spike was sculpted and joined on to the body. Other pollen were carved using a sgraffito technique. It was constructed using a grogged crank clay body with paper additions and was high fired in an electric kiln to 1260°C (Cone 8).